Changes to jobs and skills are set to have large-scale effects on companies, government and individuals across the global community. What does the future hold? How can you find the right talent to ensure growth? How can you make informed and socially conscious decisions when faced with major disruptions to jobs and skills? The analysis that forms the basis of this report is the result of an extensive survey of Chief Human Resources and Chief Executive Officers of leading global employers which aims to give specificity to these discussions. The survey aims to capture executives’ current planning and projections related to jobs and skills in the period leading up to 2022. There are three core concepts that are key to the construction of the Future of Jobs Survey: job roles, tasks and skills. Task are defined as the actions necessary to turn a set of inputs into valuable outputs. As such, tasks can be considered to form the content of jobs. Skills, on the other hand, are defined as the capabilities that are needed to complete a task. In essence, tasks are what needs to be done and skills define the capacity to do them. The original Future of Jobs Survey employed to produce the first Future of Jobs Report, in 2016, was informed by an extensive literature review on the various dimensions covered by the survey, and by continuous consultation with leading experts from academia, international organizations, business and civil society through the World Economic Forum’s Global Agenda Council on the Future of Jobs and Global Agenda Council on Gender Parity, which served as partners and advisory bodies to the study. This second edition of the survey adjusted that approach on the basis of lessons learned from that first endeavour. The updated 2018 survey now consists of three interrelated parts. Part I maps the trends that are set to positively and negatively impact business growth, the technologies that are likely to play a part in that expansion, the rationale and barriers related to this technology expansion, employers’ preferred ecosystem for support, and the workforce shifts that will be needed to effect those changes. 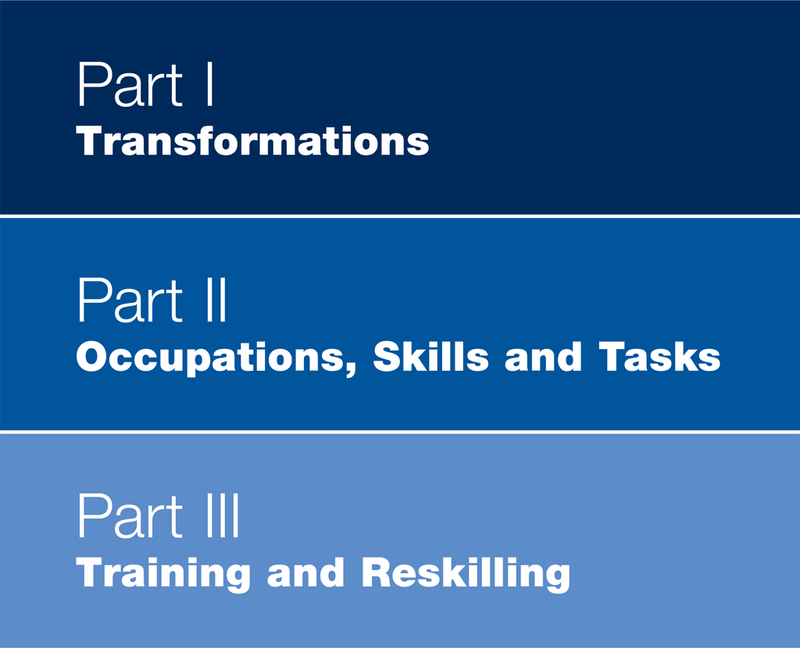 Part II maps three interlocking pillars of the labour market—occupations, skills and tasks—and provides employers with an opportunity to share the jobs that are set to experience stable, declining and rising demand. Part II also asks employers to estimate the current and future composition of their workforce, and the division of labour between humans, machines and algorithms. Part III gives survey respondents an opportunity to share their current plans for the period up to 2022 as they pertain to closing key skills gaps in their enterprises. In particular, the survey asks employers to rate the likelihood of employing a variety of strategies aimed at ensuring their businesses have the right talent to grow, to give specificity to the scale of their future reskilling needs, and to share a range of detailed information about their current and future reskilling provision. The survey collection process was conducted via an online questionnaire, with data collection spanning a nine-month period from November 2017 to July 2018. The survey set out to represent the current strategies, projections and estimates of global business, with a focus on large multinational companies and more localized companies which are of significance due to their employee or revenue size. As such there are two areas of the future of jobs that remain out of scope for this report—namely, the future of jobs as it relates to the activities of small and medium-sized enterprises and as it relates to the informal sectors of, in particular, developing economies. The Future of Jobs Survey was distributed to relevant companies through extensive collaboration between the World Economic Forum and its constituents, amplified by regional survey partners. The survey is also the result of extensive cross-departmental coordination within the World Economic Forum during which the Forum’s Business Engagement Team, Centre for Global Industries and Centre for Regional and Geopolitical Affairs supported the report team’s efforts to sub-select relevant samples. For key partners in the survey distribution process, please refer to the Survey Partners and Acknowledgements sections. Detailed sample design specifications were shared with survey partners, requesting that the sample of companies targeted for participation in the survey should be drawn from a cross-section of leading companies that make up a country or region’s economy, and should include—although not necessarily be limited to—national and multinational companies that are among the country’s top 100 employers (either by number of employees or by revenue size). In cases where we worked with a regional partner organization we requested additional focus on strong representation from key sectors represented in that geography. To ensure that the survey was representative of the relevant population, the report team conducted additional analysis, confirming the number of responses as well as the size of each respondent’s revenue and employee pool. The final sub-selection of countries with data of sufficient quality to be featured in the report was based on the overall number of responses from companies with a presence in each country—and within that subset, was based on the number of companies headquartered in the relevant location and the diversity of the sample in relation to the companies’ number of locations. In particular, the aim was to arrive at a sample in which more than two-fifths of the companies were large multinational firms, and a reasonable range of companies maintained a focused local or regional presence. The final sub-selection of industries included was based on the overall number of responses by industry, in addition to a qualitative review of the pool of named companies represented in the survey data. After relevant criteria were applied, the sample was found to be composed of 12 industry clusters and 20 economies. Industry clusters include Aviation, Travel & Tourism; Chemistry, Advanced Materials & Biotechnology; Consumer; Energy; Financial Services & Investors; Global Health & Healthcare; Information & Communication Technologies; Infrastructure; Mining & Metals; Mobility; Oil & Gas; and Professional Services. Economies include Argentina, Australia, Brazil, China, France, Germany, India, Indonesia, Japan, Mexico, Philippines, Russian Federation, Singapore, South Africa, Republic of Korea, Switzerland, Thailand, United Kingdom, United States and Vietnam—collectively representing about 70% of global GDP. In total, the report’s data set contains 313 unique responses by global companies, collectively representing more than 15 million employees (see Table 1 in Part 1). Similar to the initial report, this year’s report employed the Occupational Information Network (O*NET) framework for its categories of analysis for jobs, skills and tasks. O*NET was developed by the US Department of Labor in collaboration with its Bureau of Labor Statistics’ Standard Classification of Occupations (SOC) and remains the most extensive and respected classification of its kind. In its unabridged form, the O*NET-SOC taxonomy includes detailed information on 974 individual occupations in the United States, grouped into approximately 20 broader job families, which are regularly revised and updated for new and emerging occupations to keep up with the changing occupational landscape. For this edition of the report, the Generalized Work Activities segment of the O*NET methodology was used to form the list of tasks used in the survey. In addition, for the classification of skills, the report team employed an abridged version of the “Worker Characteristics” and Worker Requirement classifications; in particular, bundles 1.A., 1.C., 2.A., and 2.B. Additional details about the composition of the skills list used in this report can be found in Table A1. Active learning and learning strategies Active Learning Understanding the implications of new information for both current and future problem-solving and decision-making. Reading, writing, math, active listening Active Listening Giving full attention to what other people are saying, taking time to understand the points being made, asking questions as appropriate, and not interrupting at inappropriate times. Analyticial thinking and innovation Analytical Thinking Job requires analyzing information and using logic to address work-related issues and problems. Innovation Job requires creativity and alternative thinking to develop new ideas for and answers to work-related problems. Attention to detail, trustworthiness Attention to Detail Job requires being careful about detail and thorough in completing work tasks. Integrity Job requires being honest and ethical. Complex problem-solving Complex Problem-Solving Identifying complex problems and reviewing related information to develop and evaluate options and implement solutions. Coordination and time management Time Management Managing one’s own time and the time of others. Creativity, originality and initative Initiative Job requires a willingness to take on responsibilities and challenges. Creativity Workers on this job try out their own ideas. Responsibility Workers on this job make decisions on their own. Autonomy Workers on this job plan their work with little supervision. Critical thinking and analysis Critical Thinking Using logic and reasoning to identify the strengths and weaknesses of alternative solutions, conclusions or approaches to problems. Emotional intelligence Concern for Others Job requires being sensitive to others’ needs and feelings and being understanding and helpful on the job. Cooperation Job requires being pleasant with others on the job and displaying a good-natured, cooperative attitude. Social Orientation Job requires preferring to work with others rather than alone, and being personally connected with others on the job. Instruction, mentoring and teaching Instructing Teaching others how to do something. Leadership and social influence Leadership Job requires a willingness to lead, take charge, and offer opinions and direction. Management of financial, material resources Management of Financial Resources Determining how money will be spent to get the work done, and accounting for these expenditures. Management of personnel Management of Personnel Resources Motivating, developing, and directing people as they work, identifying the best people for the job. Manual dexterity, endurance and precision Endurance The ability to exert oneself physically over long periods without getting out of breath. Flexibility, Balance, and Coordination Abilities related to the control of gross body movements. Physical Strength Abilities Abilities related to the capacity to exert force. Control Movement Abilities Abilities related to the control and manipulation of objects in time and space. Fine Manipulative Abilities Abilities related to the manipulation of objects. Reaction Time and Speed Abilities Abilities related to speed of manipulation of objects. Memory, verbal, auditory and spatial abilities Attentiveness Abilities related to application of attention. Memory Abilities related to the recall of available information. Perceptual Abilities Abilities related to the acquisition and organization of visual information. Spatial Abilities Abilities related to the manipulation and organization of spatial information. Verbal Abilities Abilities that influence the acquisition and application of verbal information in problem-solving. Persuasion and negotiation Negotiation Bringing others together and trying to reconcile differences. Quality control and safety awareness Quality Control Analysis Conducting tests and inspections of products, services, or processes to evaluate quality or performance. Reasoning, problem solving and ideation Idea Generation and Reasoning Abilities Abilities that influence the application and manipulation of information in problem-solving. Quantitative Abilities Abilities that influence the solution of problems involving mathematical relationships. Resiliance, stress tolerance and flexibility Adaptability/Flexibility Job requires being open to change (positive or negative) and to considerable variety in the workplace. Self Control Job requires maintaining composure, keeping emotions in check, controlling anger, and avoiding aggressive behavior, even in very difficult situations. Stress Tolerance Job requires accepting criticism and dealing calmly and effectively with high stress situations. Service orientation Service Orientation Actively looking for ways to help people. Systems analysis and evaluation Judgment and Decision Making Considering the relative costs and benefits of potential actions to choose the most appropriate one. Technology design and programming Programming Writing computer programs for various purposes. Technology installation and maintenance Equipment Maintenance Performing routine maintenance on equipment and determining when and what kind of maintenance is needed. Technology selection, monitoring and control Equipment Selection Determining the kind of tools and equipment needed to do a job. Troubleshooting and user experience Troubleshooting Determining causes of operating errors and deciding what to do about them. Visual, auditory and speech abilities Auditory and Speech Abilities Abilities related to auditory and oral input. Visual Abilities Abilities related to visual sensory input.